Thinking a lot about an upcoming 4th birthday. Of course the new Julie Morstad book - how to - is without saying a most perfect birthday present for any age. It arrived today and it is absolutely beautiful, magical, calm and inspiring. And the bee party. I think the biggest challenge so far has been the obvious colour palette of yellow and black which I find so angry; if you study bees (as we have been doing a lot over the past couple of weeks) you actually find browns, greys, oranges and bumble bees even have white bottoms. I've pulled some fabrics for bean bags and already seeing it piled up just makes me feel less tense. Today we paused a while to watch a lavender bush humming with bee activity, after which we found another deceased bee for the fairly substantial collection amassed so far. Polly is enjoying making suggestions for the party - I think she gets that you should take a theme and run with it. Her suggestion on finding the dead bee was that maybe we could find more and put them on top of the cake to make it look pretty. As her idea took hold, she elaborated that maybe we could arrange the bees around the candles so that when you cut the cake into slices, everyone gets their own dead bee. There was me thinking that she would be happy with some yellow icing and a couple of edible flowers. Seems the last couple of weeks have been all about houses. Liberty print houses, V&A print houses, and toy houses for Merlin in the post from Josie. A fantastic hand built playhouse from Miko design. Really cute dolls house (trolls house) at Fine Little Day. And of course the week before we are due to give birth is the ideal time to sell our house and choose somewhere new to live. Those houses won't build themselves you know, Julie. Little red riding hood hand puppet, inspired by Mabs Tyler's Big Book of Soft Toys. A stack of cushions; some for Merlin's room and some for Sam and Olivia. Finally finished Merlin's first cashmere sweater, from Baby Knits for Beginners, by Debbie Bliss. A couple of blankets made from a pashmina that I have never worn and a pattern adapted from Weekend Sewing by Heather Ross. One might be for Merlin. Rounded off with a little peruse of the Liberty website where their new Art Collection fabrics are available to order online. I think I have earned a nap after which will no doubt follow more craft, maybe a swim and a cup of raspberry leaf tea. Congratulations Donald on passing your exams. Liberty have their new collection in for Winter 2009. I managed to snap a couple of sneaky pictures of my favourites for you Josie but this is the best I could do. The man who measured out my necessary purchase said samples of the whole collection would be on the Liberty website in a month, once the whole collection is in store. I think the paisley with faces on is a little freaky but the one I bought (third from left) makes me very happy every time I see it. Look away if you are broke. I knew it would be a good idea to meet Julie in Liberty. The plan was to hand over the newly stitched bedding set and cushion for Joseph over coffee and a bacon sandwich in the lovely tearoom there. I had neglected to mention that there was a sale on and within ten minutes of the doors opening one of us had a new pair of shoes and jacket and the other had a bundle of fabric wrestled from the old ladies frantically rummaging at the remnants table. Julie even had time to point out a fantastic book that she thought I might need, which of course I did. Not only are the images in this book a fantastic inspiration but I have loved reading about the history of my favourite shop. Written by Anna Buruma who is the archivist at Liberty, Liberty & Co. in the Fifties and Sixties: A Taste for Design is definitely a new favourite. I love this post by Nikalas Catlow about children's book illustrators; especially the envelopes by Satoshi Kitamura. Inchmark blogged about the new book by Heather Ross a little while ago and it immediately found it's way to the top of my Amazon wishlist. Bizarrely, as I bought it and sent it to Josie for her birthday present she was buying it and sending it to me for mine. Weekend Sewing is styled so beautifully with such lovely pictures and easy to follow instructions; there is the odd recipe thrown in for good measure which look simple and delicious; and the opening chapter about how to set up a compact sewing area in a small flat could have been written specifically for me as I lose my sewing room to Merlin (sadly I couldn't convince DD to let me install a big cupboard in the living room full of fabrics and notions). Time for a transatlantic craft off? I'm thinking of starting with the patchwork trimmed baby blanket, followed closely by a pair of guest room slippers. 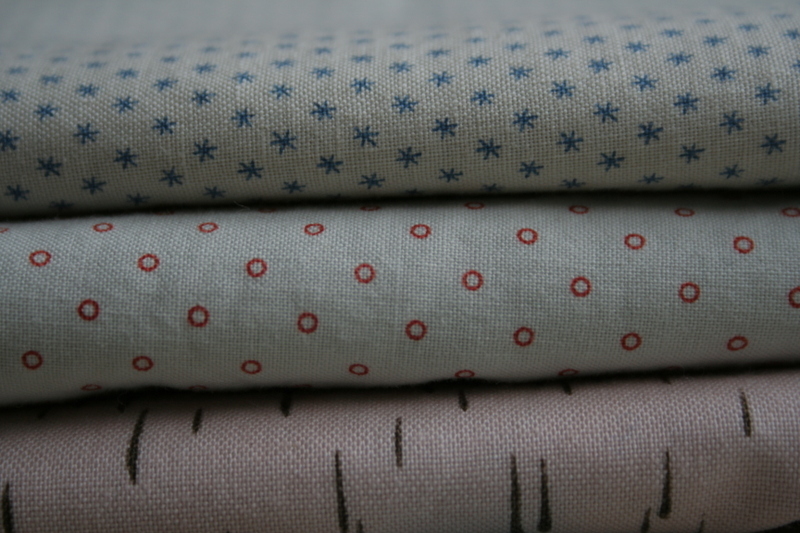 Although this weekend's sewing (at the kitchen table) mainly involves blackout lining, some polka dot corduroy and a pair of brown 1970s Miffy curtains I bought a while ago on ebay and just found again. Liberty are having a spring clean. The only problem is that I am a Taurus and I fear change; especially when it involves two rooms of fabrics, yarns, buttons, embroideries, ribbons and sewing accessories being shoehorned into one tiny, dark area next to the toilets. Instead of two walls of fabrics proudly displayed under the fantastic natural light from the huge original glass ceiling, the entire collection is rammed into less than half of the original space, with no tables to lay out your fabrics for selection as all table tops are piled precariously with books and reels of ribbon. 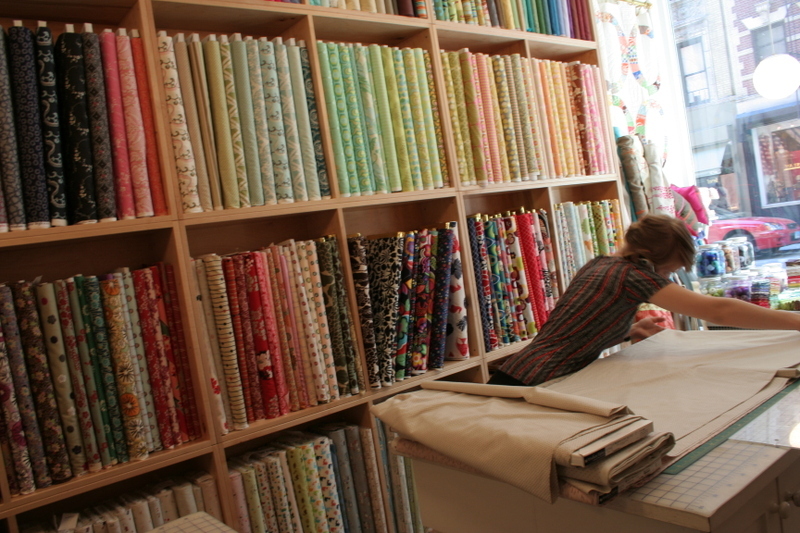 People make pilgrimmages all the way from Japan to the fabric department of Liberty - I have to make the arduous journey from Tooting - how nice to feel we are such valued customers. 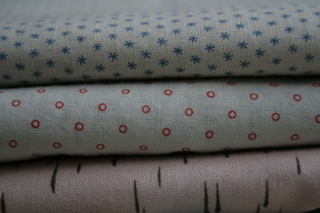 At least some of the new collection of fabrics are up to scratch. I love the handle of the fabric and how it can be applied to any project. More importantly, I love the prints which make up a biannual collection and are never reprinted. This quilt was based on a 1950s cotton scarf with poodles on that I bought on Portobello road, surrounded by various vintage fabrics, an old pair of pyjamas and several Liberty prints. 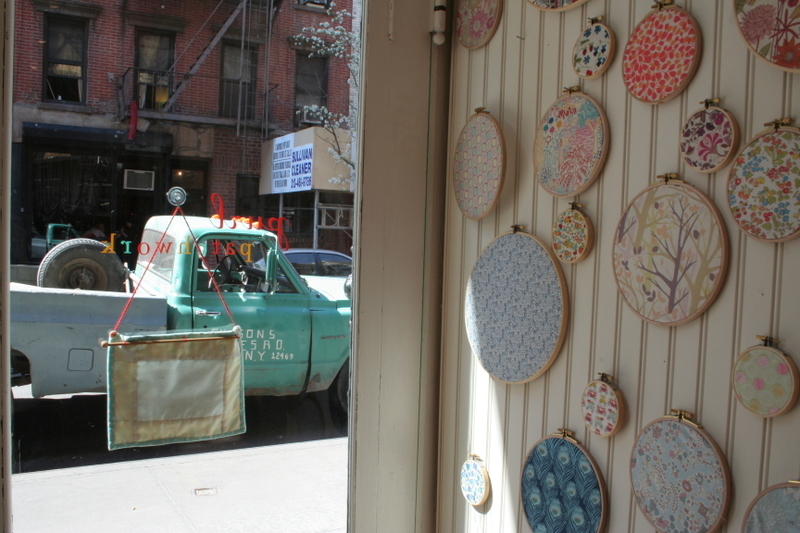 Lucky for me I get to go to the Liberty shop in person; otherwise I like to buy Liberty fabrics from this ebay shop and of course there is a good selection at the purl soho store in New York. All very well buying them (or receiving kind donations from a certain friend) - I am going to have to pluck up the courage to use them with a bit more freedom. One day I hope to make another quilt using Liberty fabrics as the actual starting point, as Josie does so beautifully here and here. were you to ask my oldest friend phillis, she would recount the years she has had to put up with constantly updated birthday reminders. 'it's my birthday in six months'. 'it's my birthday in two months'. it's my birthday in 3 weeks'. so this one's for you phil: 'it's my birthday in 4 days'. I am happy to be embarking on a whole week off and an excuse for treats. one of my favourite passtimes is trying to prolong my birthday for as long as possible. thus began the birthday treat schedule on thursday in new york. having forced the mcagates to stay out way past their bedtimes the previous night, I descended upon wnyc in new york's city hall to watch nuala at work. I've only ever seen the workings of a radio show on frasier (interior sound-proofed rooms with big windows to the corridor through which you see a dj surrounded by technical equipment), so it was great to sit in and understand just how many and exactly what it takes to nudge a two hour show out smoothly.